Arrival at Singapore airport, On arrival you will be meet our representative and transferred to the Hotel. In the evening you will be heading to the world's first nocturnal zoo "The Night Safari" which is one of the most popular tourist attractions in Singapore. This is where you can enjoy the tribal performances, and explore the rainforest at dusk. Also visit the Singapore Zoo with tram rides and walking trails through rainforest past elephants, tigers & leopards. Singapore Zoo is known wherein the animals roam freely in open and natural habitats. O/N Singapore. Explore the city by driving round the Civic District, passing by the Padang, Cricket Club, historic Parliament House, Supreme Court and City Hall. Get clicked with the Merlion, Singapore's most famous landmark and enjoy the view of Marina Bay, continue the journey for visit to Sentosa Island - Asia's Favorite Playground (Sentosa Island Admission, Cable Car, Luge &Skyride, Wings of Time). O/N Singapore. Buffet Breakfast at the hotel. 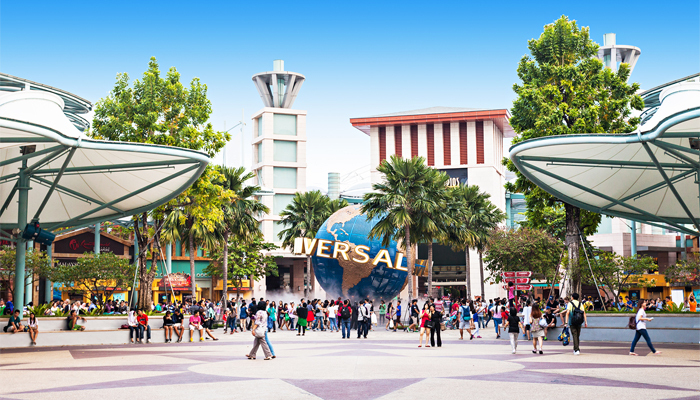 Proceed to Universal Studio Singapore which is a theme park located within Resorts World Sentosa on Sentosa Island. It promises to be a truly unique, world-class movie theme park - designed with careful attention to creating weather-protected experiences that enhance the natural setting of Sentosa Island. Experience the cutting edge rides, shows and attractions based on your favorite blockbuster films and television series, including TRANSFORMERS The Ride: The Ultimate 3D Battle, Sesame Street Spaghetti Space Chase, Shrek 4-D Adventure, Jurassic Park Rapids Adventure and more. Sea Aquarium -Large aquarium & resort featuring 800 species of marine life in a variety of habitats. Overnight in Singapore. Buffet Breakfast at the hotel. Proceed to Jurong Bird Park is a 20.2 hectare open-concept park. It is the largest in the Asia Pacific and the best in the world. Its collection of more than 9,000 birds from 600 species is among the largest in the world. The Park specializes in birds from South Asia. The Park has four aviaries, among which is the world's largest walk-in aviary with the tallest man-made waterfall for visitors to enjoy a close-up view of free-flying birds from Africa and South American Birds, staged at the Pool Amphitheater and Fuji Hawk. In the afternoon visit Gardens by the Bay, the nature park spanning 101 hectares of reclaimed land in central Singapore, adjacent to the Marina Reservoir. The park consists of three waterfront gardens. Walk on the suspended walkway between two Super trees to enjoy a bird's eye view of the gardens. In the evening, catch the sky show of choreographed lights and sounds at the Garden Rhapsody amidst the Super trees. O/N Singapore. After breakfast leave for cruise terminal. Check in for Dream Cruise - Dream Cruises is Asia's luxury cruise line that aims to redefine vacation travel with a transformational journey at sea. Genting Dream is vessel designed for your dreams – featuring the comfort of authentic Asian hospitality combined with only the finest experiences from around the world.. O/N Cruise on High Seas. Enjoy at leisure moment at Cruise. Day 07:Cruise – Singapore Airport Drop. Check out from the Cruise. Transfer to Singapore Airport. Journey Ends here. Complete Journey of Singapore Sightseeing by sharing Coach. Entry tickets Night Safari & Zoo&Singapore Flyer. Entry tickets Jurong Bird Park & Garden by the Bay. Transfers from Hotel to Terminal & Terminal to Airport. All Meals (02 Dinner + 02 Lunch + 02 Breakfast) + All Day dining at allocated restaurant on board. Rates are valid for Indian passport holder only. The rights to vary, amend, alter or withdraw any particular itinerary, departure or excursion rests entirely with the company. Any damages caused to the hotel rooms/coach during your stay, shall be borne by the concerned passengers. Check-in at hotels is 3 PM and check-out is 12 PM. Missed or delayed flights can lead to changes in itinerary and will be at the clients' expense should the case arise. Veg meal will be served in Restaurant where Veg and Non veg both are cooked. Jain meals will be available on Request. Passport ( Validity more than 6 months with minimum 3 blank pages ) + old passport. For Salaries persons- Original Leave Sanctioned Letter with company stamp on it. NOC letter from child's parents with both parents photo id proof for signature.verification. NOC letter from girls parents with both parents photo id proof for signature verification. If engagement is done then 2-3 engagement photographs and mention in the covering letter that marraige ceremony is on what particular date. Processing time is 3-4 working days (This excludes the day of submission). 60 Days Prior to Departure 10% of the Tour Cost. 45 Days Prior to Departure 25% of the Tour Cost. 30 Days Prior to Departure 50% of the Tour Cost. All payments made according to the payment schedule are non-refundable and non-transferable in case of cancellation for whatsoever reason including non-grant of VISA or deportation or for any other reason. For scheduled departure tours, a transfer from one tour to another or a change of departure date before the departure will be treated as cancellation on one tour and rebooking on another and hence will attract the applicable cancellation charges.